During my master’s years, I had the privilege of co-organizing the Carleton University Underhill Graduate Student Colloquium with Jenna Murdock Smith, friend and fellow archivist. Established more than 20 years ago, the Underhill Colloquium provides an opportunity for master’s and doctoral students from all disciplines to present papers on topics related to history. I loved the experience and it instilled in me a deep respect for the organizers of conferences. 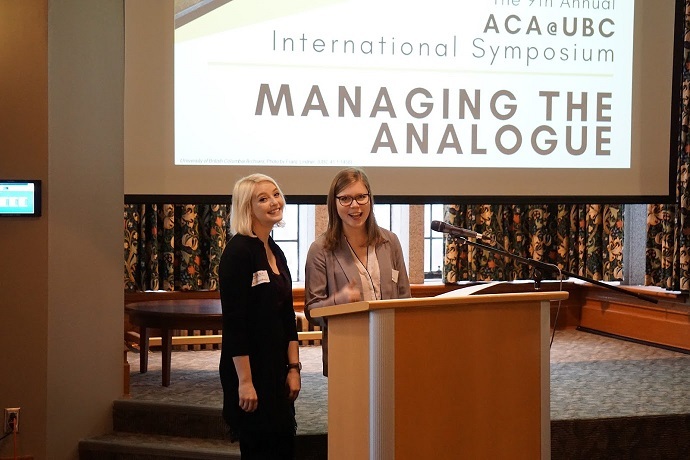 I know how difficult it can be to organize a major symposium while pursuing graduate studies, so I wanted to give kudos to the student organizers of this year’s ACA@UBC International Symposium. They organized a stimulating series of talks from a diverse range of professionals. The ACA student chapter at UBC is an active organization of passionate and committed graduate students who work to engage with the profession during their studies. Each year, their International Symposium gathers prominent academics and practitioners from around the world to bring diverse perspectives to the students and professionals working in British Columbia. This was my third year attending the symposium and this year’s topic, “Managing the Analogue,” was one that I was very interested in. Our profession is rightly concerned with all things digital at the moment and much of our professional discourse focuses on the management of born-digital and digitized materials. These are certainly discussions we need to be having, but the reality is that the majority of our existing collections and many new donations are analogue. While we grapple with the digital Sword of Damocles hanging over our heads, we remain responsible for the preservation of analogue materials in our custody. It was refreshing to have a day to discuss our analogue concerns. Mary McIntosh (BC Government Records Service) kicked off the day by inviting us into the microfilm security vault: a place, it would seem, where few venture these days. Her description of the vault felt oddly familiar, as we are grappling with similar issues with microfilm in Coquitlam (albeit on a much smaller scale). She walked us through the history of microfilming in the BC government, which has almost completely ceased. Where once they accepted thousands of rolls per year from various departments, the transfers have dwindled to a few hundred in recent years. A project was undertaken in the early 2000s to inventory the contents of the vault, to improve location controls, apply retention schedules, and address conservation concerns with regard to vinegar syndrome. In her talk, Mary brought up an interesting catch 22 when it comes to the preservation of and access to microfilm. The Government Records Service has seen retrieval requests dwindle over the years. Last year, only 90 reels were recalled out of the 170,000 in storage. Is this a product of a lack of demand for these records? Or is this a result of a lack of awareness? Do departments even know these records exist? Would they use them more if they were more easily retrievable, with indexes and finding aids? These are questions I am sure many are struggling with in their institutions, especially those working for public bodies that used microfilming as a regular records management technique for decades. Mary hopes that some lessons from the vault could be applied to other contexts. She wants to learn from the impenetrable vault and ensure there is appropriate metadata and project documentation, to avoid creating the mystery vault of the future. Bob McIntosh (Library and Archives Canada) addressed the crowd on the topic of managing the analogue record in a digital environment. He explained that Library and Archives Canada has made a significant commitment to digitize all of the First World War personnel files – some 640,000 files containing approximately 20-30 pages per file. The expectations of patrons are that everything will be digitized but Bob was able to provide a compelling argument as to why this simply isn’t possible. The cost to digitize the service files will amount to $20 million by the end of the project. That figure may not even take into account the long term storage, maintenance, and migration costs associated with these files once they are digital. Considering LAC has an annual budget of just over $90 million, $80 million of which is dedicated to staffing and overhead costs, this leaves little room for mass digitization projects. Bob’s presentation really made me consider the difference between expectation and reality. There is an expectation that a google search is all you need, but archivists are well aware that archives are an iceberg, with much more beneath the google-able (that’s a word, right?) surface. There is also the expectation that archives will be able to acquire every important collection that is offered to them. But this leads to the dreaded (or strangely accepted) backlogs in virtually all archival repositories. This is where the expectation of processing meets the reality of a lack of resources dedicated to processing. Bob wondered why we don’t adjust our acquisition appetite to our meet our processing capacity? During the question period, I ventured an answer, suggesting that acquisition is simply sexier than processing. The grand announcement of a brilliant new acquisition is much more compelling than a press release about re-housing that collection in acid-free folders. I know we get excited about a wall of processed hollingers, but that image is a tough sell to the outside world. Perhaps we need to learn how to communicate the processes better so that there is an appreciation for what goes into making records accessible and available. Terry O’Riordan (Provincial Archives of Alberta) attempted to cram a two day workshop into a half hour presentation about preserving audiovisual materials. He provided a whirlwind tour through historical audio and video formats, sharing tips for media identification and rules for handling the various types. He recommended that archivists should seek the advice and knowledge of local A/V Societies, who are in a position to offer guidance on obscure formats. He playfully recommended developing a network of nerds (“geeks” shouted someone in the crowd). No archivist could ever truly be an expert in all media, so it is important to build a web of knowledgeable people to rely on. Terry alerted the room to the uncomfortable reality that not all of our A/V collections will survive, making appraisal and selection within existing collections all the more crucial. We need to prioritize items for preservation and migration, which will lead to difficult decisions. He stressed that the most important aspect of any migration project is recording the step metadata to keep track of what was done and who did it. Teresa Rowat explored the emotional dimension of descriptive practice. Often we dismiss emotion in our work. We remove ourselves from our objective descriptive practices, but Teresa reminded us that the emotive dimension is tied to the analogue. She addressed an interesting question – can we feel the same emotional pull to a digital record as we can to a physical one? What about a photograph of an analogue record? Teresa wondered whether the emotional experience relies on the existence of the analogue record, or even the acceptance that it exists somewhere, in the case of a digitized version. She argued that a physical item has a physical history and therefore, it can spark different layers of reaction that strengthen our understanding. Her example was incredibly moving. She showed a few lines of text describing the date and the weather. Obviously, these lines made no emotional impact until she revealed they were the opening lines of a letter written by Louis Riel to his wife on the day of his execution. Suddenly, you could feel the emotional power of the record. We could then imagine the impact the actual physical item might have on us. Teresa explained that as you handle the document, you are inextricably linked to the creator and everyone who has ever handled the document. When we digitize, we democratize access, but can we connect with the document in the same way? Teresa explained that a RAD description just doesn’t quite cut it to explain the materiality of documents. She suggested that we need to find ways of adding to our descriptions to relay this emotional dimension. George Blood (George Blood Audio/Video/Film) provided a strange conclusion to the day, opting to berate the crowd for the desire to create metadata standards that fit each exact institutional case. He urged the crowd to commit to existing standards in order to advance digital preservation. Suffice it to say that not everyone was in agreement with George, but his point that perhaps archivists need to learn how to better maximize the impact of our time and budgets was well taken. I do agree that we need to demonstrate that we are using 100% of our resources before we are able to argue effectively for additional resources. Point taken, but I think the majority of archives in Canada are well past the 100%. 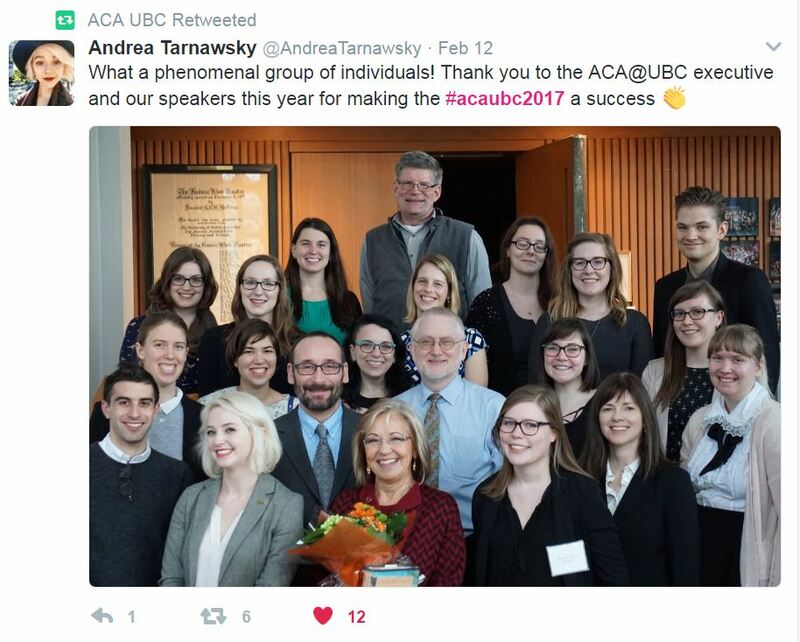 Thanks to the many students, faculty, and speakers who made the ACA@UBC Symposium such a thought-provoking experience this year. It was refreshing to be able to think and talk about the analogue in our lives, because it’s here to stay…as long as we can locate, manage, preserve, and migrate it.